Gas chromatography mass spectrometry (GC/MS) analysis is an effective testing and troubleshooting tool for many manufacturers across industries, helping identify and quantify the materials that make up a sample or uncover contaminants that impact product quality. But when it comes to making sense of GC/MS analysis results, you may wonder how to read a gas chromatogram or how to interpret the results. Your lab should be providing you with detailed insights and actionable recommendations in an easy to understand format; something Innovatech Labs prides itself on. With that said, we’ve developed this handy guide to interpreting GC/MS data to help our customers—and anyone else who’s interested in knowing how to analyze a gas chromatogram. In order to understand GC/MS results, it’s helpful to know a little bit about how GC/MS analysis works. Generally speaking, if a sample isn’t already in gas form, it’s introduced and volatilized in the injection port of the gas chromatograph. 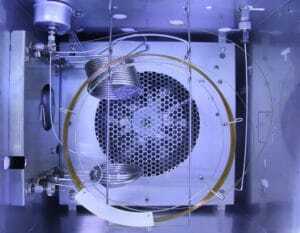 The gases then pass through a column, which is coated with material to attract the various components of the sample at varying degrees. This is called the stationary phase and it’s the level of attraction during this phase that causes components to separate and elute at different times, which shows as peaks on the resulting chromatogram. Usually, the x-axis of the gas chromatogram shows the amount of time taken for the analytes to pass through the column and reach the mass spectrometer detector. The peaks that are shown correspond to the time at which each of the components reached the detector. The type of column used during the analysis, as well as the GC parameters (e.g. flow rate, injection temperature, oven temperature, etc. ), have a large impact on the retention time. As a result, when comparing retention times from different analyses or different labs, it’s critical that the same parameters are used to ensure accuracy. Typically, the y-axis, or the area of the peak, is a reflection of the amount of a specific analyte that’s present. When looking at a GC/MS chromatogram, the area will be based on the number of counts taken by the mass spectrometer detector at the point of retention. However, it’s important to note that some compounds will have a better affinity with the detector and the peaks will appear larger than the actual concentration would be in relation to the other peaks on the chromatogram, which we often see in compounds that ionize readily. To overcome this challenge, our experts run standards with known concentrations of compounds to ensure accurate counts. In addition, unknown compounds are identified based on their retention times of known standards with other detectors. The mass spectrometer detector then allows identification of a compound by mass spectrum obtained at the time of testing. At a high level, depending on the type of sample and the desired outcome, gas chromatography analysis can use several different means of sample introduction, such as static headspace analysis, thermal desorption, and direct injection, as well as different types of detectors, such as flame ionization (FID), electron capture (ECD), and—of course—mass spectrometry. As a result, chromatograms can often differ in how they appear. However, even with variations, the basics of understanding chromatograms, as outlined above, remain the same. But one key point we’d like to reiterate is that it’s important to remember that the systems and parameters used for an analysis need to be similar when comparing results from two or more different analyses. This ensures you’re getting the most accurate comparison and drawing meaningful insights. A manufacturing client of ours discovered an epoxy used in their device was failing to function as intended. After performing epoxy outgassing analysis, you can see that we tested and compared two different samples: a reference epoxy (top) and the failed epoxy (bottom). Results showed that the failed epoxy has a large cluster of Benzene compounds (y-axis) at approximately the 9-minute mark on the retention timeline (x-axis)—which is something that wasn’t seen in the reference epoxy. In this case, a food manufacturer was considering switching to a new vegetable cooking oil. 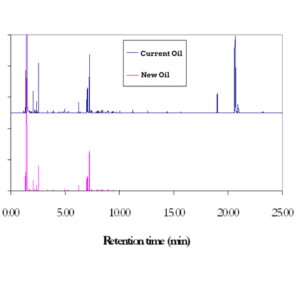 After a vegetable oil analysis of both their current and a potentially new oil, we found that their current oil contained several different compounds including: palmitic acid (retention time of 19.00 minutes), linoleic acid (retention time of 20.6 minutes), oleic acid (retention time of 20.7 minutes), stearic acid (retention time of 20.9 minutes). For this analysis, a pharmaceutical client wanted to know if ethanol, which was used in the manufacturing process, was still present in the final product. Using GC/MS headspace analysis, we conducted residual solvent testing to find out. As you can see, a possible residual solvent peak was found at approximately 1.67 minutes. We then compared our findings to ethanol mass spectrum data to confirm the residual peak was in fact ethanol. 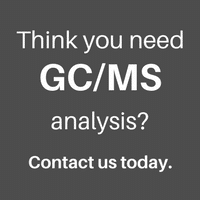 Have More Questions About GC/MS Analysis? Gas chromatography mass spectrometry analysis is an incredibly helpful quality control and troubleshooting tool with wide-ranging applications. If you have more questions about the technique or are wondering if it may be a fit for your testing needs, get in touch with us today. We’re here to help.